How a Christian family dealt with grief after the loss of their daughter. In this Christian-based bereavement guide, a mother and father provide honest advice and practical tips on the painful subject of grieving the death of a child. Hundreds of infants, children, and young adults meet death everyday. In the early evening hours of June 20, 1997, the life of Valerie Victoria James ended as the result of a car accident. Valerie was a vibrant, enthusiastic, beautiful Christian teenager. She was an integral part of her community and school, her favorite organizational activities, and her close knit family. But Valerie's death started her family on a journey to overcome their overpowering grief. In the process, she helped them discover a number of miracles the secular world would label as coincidences. Is there such a thing as closure? What do you say to a bereaved family? "It's the Journey. 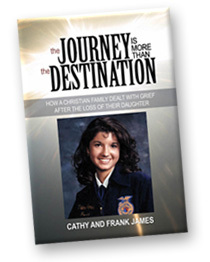 Not the Destination, Mom" provides the pointers and guidance that will help any bereaved family, family member, or friend of a grieving Christian to endure the journey they must travel following the loss of a child.